This photo makes me smile every time I see it. It was taken by one of my favorite people of one of my favorite people . 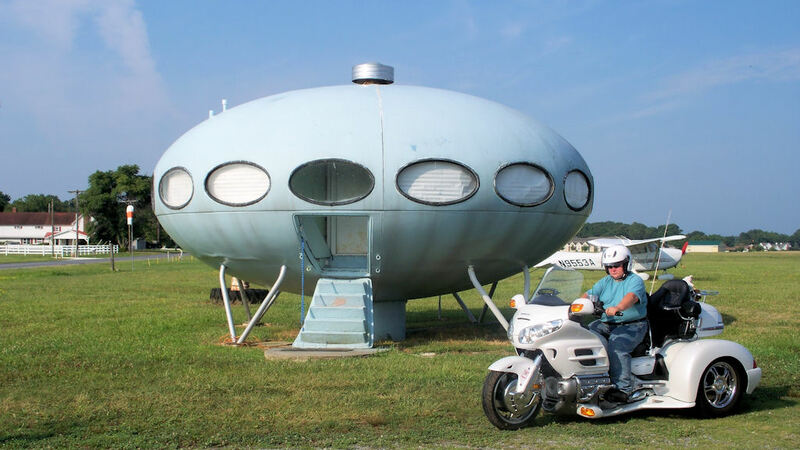 . . and in front of a UFO house, no less!! A RoadsideWonders Trifecta! Snagged this on a ride with Ice (my lovely model). The house is at the airport and seems to be used for storage. Looks like a Jetson house! Interesting, I took a picture of a similar house in North Texas: http://i6.photobucket.com/albums/y210/wbmiller3/HPIM3421.jpg. Wonder if they were mass produced somewhere. Always enjoy your site.